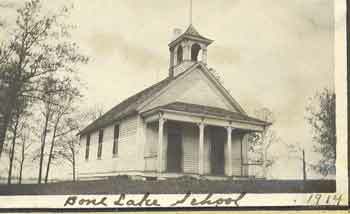 Bone Lake School in 1914. DISTRICT FORMED District petitioned in 1892. 1860: The first school was in the residence of John Nelson, 30 years before the District was petitioned. Enrollment in 1898: 43 students. Other teachers: (before 1898): A.B. Falk, Louis Lammers, Nancy Weberg, Edith Weberg, Lucy Brown, Dora Kenyon, Adolph Torelle. 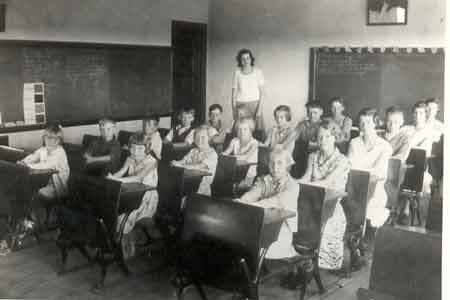 Bone Lake School 1932-33, Verna Lindblad – teacher. Students are, from left to right: Gladys Mae Benson, Donald Sandgren, George Larson, Wallace Larson, John Jelmberg, Ralph Struck, Hazel Pingius, Lorraine Swenson, Evelyn Larson, Eleanor Jelmberg, Franklin Peterson, Leonard Carlson, Pearl Bloom, Selma Ringius, Ed Larson, Plassie Bloom, Beatrice Swenson.